Grab your napkins and sPORKS and go hog wild over today’s food holiday. April 24 is National Pigs In A Blanket Day! Even though the first recipe for pigs in a blanket as we know it was published in Betty Crocker’s Cooking For Kids in 1957, different versions of this meal existed long before then. As far back as the 1600s, field laborers in England were putting meat inside of dough for a quick, nourishing, and portable meal. Pigs in a blanket is basically pork wrapped inside something else, though the type of pork (and the blanket itself) has varied greatly over the years. A popular version in the 1800s consisted of oysters that were rolled in a slice of bacon, pinned together with a toothpick, grilled, broiled or fried, and served hot on toast. But in this case, the pig is the blanket, he’s not IN the blanket. That’s just not right! Nowadays, the dish most often refers to hot dogs, Vienna sausages, or breakfast sausages wrapped in crescent dough or a pancake and baked, unless you’re in Europe, where cabbage rolls are often called pigs in a blanket. Technically speaking, that makes perfect sense. They became a popular party food in the 1960s, and for a while in the 70s Pillsbury sold a canned version that was ready to bake. Apparently, they thought the American consumer was wasting too much time and effort actually rolling a hot dog inside dough. It IS an awfully labor-intensive task – amazing that the canned version never really caught on. /sarcasm. Pigs in a blanket are also called devils on horseback, kilted sausages, and wiener winks. 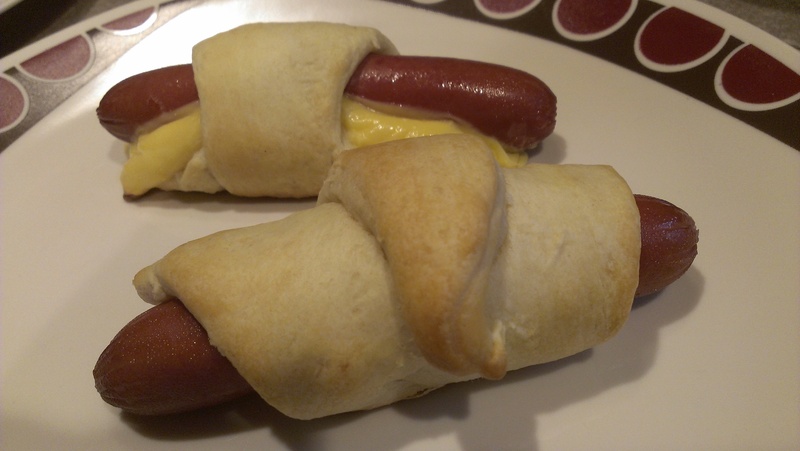 We decided to stick with the tried-and-true and make pigs in a blanket with crescent dough and hot dogs. We even added a slice of American cheese to some of them. For such a simple and lowbrow meal, I have to say, they were pretty damn tasty! So what did Tara think? Believe it or not, she liked these!! !